By Ross Elliott - posted Wednesday, 20 February 2013 Sign Up for free e-mail updates! 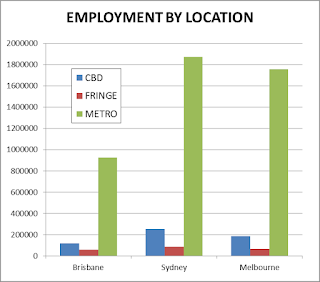 This series of research articles has been prepared to shed some light on what I’d like to coin ‘the demography of employment.’ Much of the data is based on analysis of various ABS Census and I am indebted to the professional team at Urban Economics for providing this and for interrogating the Census findings so diligently. Other sources are noted where relevant. However the conclusions and observations are my own so if you want to obtain research related to your particular interests, please contact Kerrianne Bonwick at Urban Economics directly. This article was first published on The Pulse. Research data was provided by Urban Economics, and principle Kerrie Bonham can be contact on 3839 1400.